This is the second in my series on Wholeness where I intend to revisit my own journey and try to map my own personal growth onto a simple timeline… so this article is about “Realisation”. And as I write this page I realise that there has not been one or two of them but more of a continuing flow especially when I began my own self-growth journey. A Realisation is one of those moments of complete clarity: suddenly you understand something, a decision makes itself or an unplanned event just happens… out-of-the-blue, no turning back. This may be life-changing like starting or ending a relationship, taking a new job, a career change, moving to a new town, falling out with friends or family or something less significant like decluttering your home or wardrobe just because it feels right. More Ingredients Please This in itself was a significant Realisation that I had along the way. I had reached landmarks in my life which I was very pleased with but still had this discomfort within that I was not complete. I did not deliberately chase change and really did try to make the best of where I was but life knew better and threw me opportunities I could not resist!? It was not until I faced a really challenging phase in my life when opportunities just stopped happening and I felt overwhelmed by circumstances that my trust in this process deserted me… all I could do was dig in and get myself through each day. But had my Journey stopped? 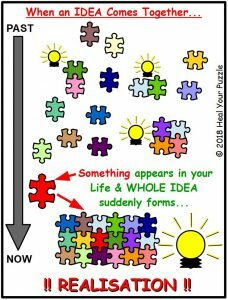 A puzzle had actually formed and all those life-changing events mentioned above happened all at once! I actually finally had the people in my life that I wanted but everything else that made me feel secure disappeared. But a new puzzle was in process, a new Realisation was forming. I was being made aware of why I had felt empty and now I was learning how to feel truly Full of Life…to feel Whole! This has become a step-by-step inner process which I have shared here with you along the way and I now look forward to what unfolds.